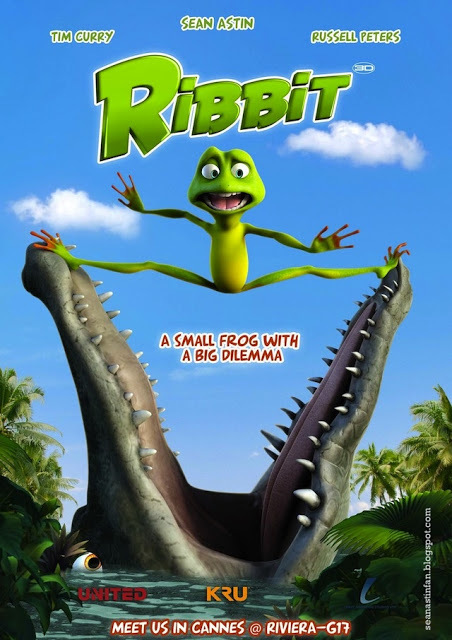 Ribbit – animated movie review by Fred Patten. Ribbit, directed by Chuck Powers. 88 minutes. September 4, 2014. This CGI animated feature was released theatrically in Malaysia, in Malay, on September 4, 2014. But I saw it at my sister’s on On Demand TV in English on January 16, 2015. It is not the worst movie that I have ever seen, but it comes close. What is most interesting about it is that it was produced by KRU Studios in Kuala Lumpur, Malaysia’s capital; but it was directed by Chuck Powers, the American vice president of animation of KRU Studios, and the voice director of hundreds of episodes of foreign TV animation, mainly Japanese, into English. Powers is also the co-writer of Ribbit with Amir Hafizi. 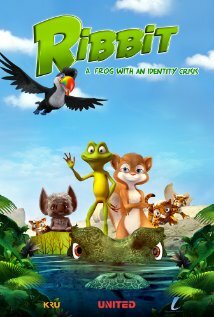 Ribbit’s American voice cast includes Sean Astin, Tim Curry, and other Americans, implying that the movie was made primarily for an American release. It was premiered in America at the Niagara Integrated Film Festival on June 21, 2014, and released on October 17, 2014, appearing on Time-Warner’s On Demand TV the same day. It will be available On Demand through February 14, 2015. In America, its theatrical distribution is handled by Crest Animation Studios (Richard Rich’s company in Burbank, known most recently for Alpha and Omega and The Swan Princess and their direct-to-DVD sequels). Ribbit is not like the other frogs around him on the Amazon River. (The location is established immediately with capybaras and giant anteaters on the riverbanks.) The other frogs are green and like to hop and swim, which he hates. Ribbit is bright yellow and red, which he remarks – often – marks him as a very poisonous tree frog. He feels “out of place” in his jungle community, which he constantly complains about to his best friend, Sandy, a flying squirrel. She regularly challenges him to do something about it, but it is not until his home (a wrecked airplane in a tree) is sent crashing to the ground by Rafa, Marcella, and Luciano, three ocelot cubs jumping about in it, that Ribbit sets out to find “where he belongs”. Sandy accompanies him to “keep him out of trouble”. The movie is a picaresque journey, with several other animals usually met only once. Starting with the ocelot cubs, they include Deepak, a bat mystic who convinces Ribbit that he is an enchanted human who needs to kiss a human Princess to regain his true form. Terrence, a gaudy toucan, flies Ribbit and Sandy to a broader spot on the Amazon where they are more likely to meet humans. A family of howler monkeys encourage them, but Kai, a caiman, tries to eat them. Jojo and Ollie, two manatees, save them, but a giant spider menaces them again. Kai returns (the only animal to do so) and chases them over a waterfall, where all three are washed into an Indian village the day before its teenage Princess is to become Queen. The tribe’s jealous Witch Doctor plots to poison her with scrapings from captured poisoned frogs; Ribbit’s brethren, led by brave but hapless Inego. Ribbit tries to stop the Witch Doctor while Sandy frees the imprisoned frogs, but both keep getting thwarted by Kai, who is being kept as a “good-luck pet” by the Witch Doctor. Ribbit and Sandy succeed at the last minute. The Princess kisses Ribbit out of gratitude, and when nothing happens, Ribbit and Sandy settle down among the frog community. Where to start listing the errors, or supposed humorous bits that the filmmakers hope that children will not recognize are out of place? Why is Ribbit the only character with a sound effect for a name? Why is he so obviously out of place among the other upriver frogs? Why does the bat seem to be an East Asian mystic (with a name like Deepak – it’s Awie in the Malay release — except as a nod to the Malaysian audiences)? According to Wikipedia, flying squirrels do not live in South America. South American animals like capybaras and toucans that children are likely to know are drawn realistically (allowing for a cartoony art style), while those such as manatees and caimans, not so much so. The caiman looks more like a regular crocodile, and the two manatees are color-coded (lavender and blue; for gender?)! And talk in burlesque German accents! The spider has an equally exaggerated French accent, full of Sacre bleus and Zut alors, for no apparent reason! I haven’t researched every bit of the Amazon River, but the number of stretches of rapids and towering waterfalls is not convincing. When the riverside native Indian village and the poison-frog community are shown, the village is studded with Mayan temples, and the other poisonous frogs are bright blue where Ribbit is bright red. The Witch Doctor’s plot to poison the Princess at the height of her coronation feast seems about as obvious as the Vice President pulling a gun and assassinating the President at his Inauguration so he will become the President instead; he would never get away with it. If Ribbit is poisonous, how does he avoid poisoning Sandy and all the other animals with whom he comes into close contact? The movie ends with an implication that Ribbit and Sandy will get married and settle down, which is nice if you don’t mind a frog and a squirrel marrying. Considering that Malaysia is not known for its animation, Ribbit seems pretty good. The worst complaints are that the animation does best with bright colors (no subtlety of shades), and the most amateurish animation is of the humans. The movie’s plot and other errors like putting Mayan temples on the banks of the Amazon are presumably the fault of the American director/co-writer. Let’s hope that other Malaysian animated features will be better. “Ribbit” features two songs. As long as KRU Studios had the computer algorithms to create the animal characters of “Ribbit”, it reused them for the original animation of a 3’23” music video of “Destiny”, one of the songs, produced by KRU Music. The song is performed by SuPreme featuring Felice LaZae. The music video features Hip Hop music star DJ Motiv8 (Monroe Walker). Great step forward for Malaysian animation. Hopefully they manage to come up with their own stuff and stop relying so much on American producers/directors/writrers who aren’t very good at the writing or directing parts. The giraffe falling for a hippo is what made me stop enjoying Madagascar 2. Not sure if I will ever watch this one, but the errors you listed seem minor, since animal facts aren’t terribly important in simple fiction.